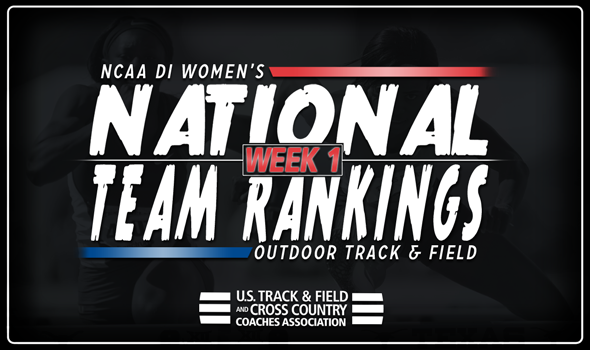 NEW ORLEANS – A big weekend of outdoor track & field benefitted the SEC, as two new women’s teams snuck into the top-five of the NCAA Division I Women’s National Team Rankings, announced by the U.S. Track & Field and Cross Country Coaches Association (USTFCCCA) on Monday. Texas A&M moved up three spots to third, while LSU jumped four spots into fifth, joining national leader Arkansas from the SEC. Texas A&M was impressive at its in-state rival’s meet, the Home Depot Clyde Littlefield Texas Relays. In Austin, the Aggies netted six NCAA Division I top-10 Descending Order List marks, including third place marks in the discus by Serena Brown and in the heptathlon by Tyra Gittens. Also competing at the Texas Relays were the LSU Tigers, putting on a show in the 100 meters. A trio of Tigers in Aleia Hobbs (10.86), Kornei Johnson (10.97) and Mikiah Brisco (10.99) dominated the event, with the three marks currently sitting first, second and fifth on the NCAA Division I Descending Order List. Kymber Payne also ran the fastest 400 hurdles time in the nation this year at 55.92, while Tonea Marshall’s 100 hurdles time of 12.73 is good for second in NCAA Division I this season. Arkansas maintained its top spot in the rankings with a solid showing in Austin, as well. Taliyah Brooks’ 5946 in the heptathlon is good for second on the Descending Order List this year, as is Lexi Jacobus’ pole vault mark of 4.55m (14-11). Victoria Hoggard joined Jacobus in posting a strong pole vault mark with a leap of 4.50m (14-9), sitting right behind Jacobus on the Descending Order List. The Pac-12 posted the other two top-five teams in this week’s rankings, with Oregon and Southern California staying put at second and fourth, respectively. The Ducks traveled south to the Stanford Invitational this past weekend where it saw Lilli Burdon post the fastest 5000 time in the nation this year at 15:42.65. Southern California competed at the California Collegiate Open, where Breana Jemison’s shot put mark of 17.57m (57-7¾) was good for fourth in the nation this season. Two other SEC squads are right on the cusp of the top-five, as Kentucky (sixth) and Florida (seventh) each moved up in the rankings. The Wildcats posted eight NCAA Division I Descending Order List top-10 marks at the Florida Relays, including Sydney McLaughlin’s 50.07 in the 400, good for third in the outdoor collegiate record books. The stellar freshman also posted the nation’s top 200 time at 22.39 while also helping the 4×400 relay team notch a 3:26.92 for the top time in the country this year. Florida had success at its home meet, as Sharrika Barnett (400) and Yanis David (triple jump) now sit second in the nation in their respective events after the Florida Relays. Rounding out the top-10 were Texas, Georgia and Kansas State. Each team dropped at least three spots in the rankings from the preseason poll.